Eczema is one of the most common skin conditions that occur in children and adults. Thirty million Americans in the United States suffer from some form of eczema. The good news is that eczema symptoms, like itching, pain, and redness, are treatable. 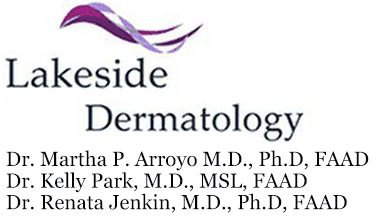 Martha Arroyo, MD, PhD, FAAD uses the most advanced treatments available to give relief to patients at Lakeside Dermatology in northern Illinois. Call today to schedule an appointment at the Gurnee or Libertyville office. Eczema isn’t a single disorder, but a group of conditions causing dry, itchy, inflamed skin in children and adults. Some forms of eczema make the affected skin appear lighter or darker. Though it usually appears on the hands, feet, face, and behind the knees, eczema patches can show up anywhere. Though the exact cause of eczema is unknown, experts believe it occurs when the body’s immune system overreacts to a stimulant. But it’s not contagious and can’t be transmitted from person to person. There are eight different types of eczema, all producing some of the same symptoms. More severe forms of eczema cause blisters or sores that crack or weep. But eczema symptoms are highly-manageable with expert care from Dr. Arroyo. There’s no test for diagnosing eczema. Dr. Arroyo asks questions about your overall health, habits, and looks at the affected area before determining if eczema is causing your symptoms. Treatment varies depending on the type of eczema you have. Dr. Arroyo may also perform an allergy test to figure out what substances trigger your symptoms. Stopping exposure to the irritants that cause a reaction is the first step toward reducing painful outbreaks. Soaps, lotions, detergents, heat, dust, dander, itchy fabrics, and stress can all be triggers. If you don’t quickly treat the itching and irritation from eczema, an infection can develop. For that reason, Dr. Arroyo usually prescribes medication to reduce itching and inflammation. For adults with severe eczema, Dr. Arroyo sometimes prescribes medication that suppresses the immune system and the inflammation process, reducing symptoms significantly. Phototherapy also has proven particularly useful in reducing rashes. No one has to live with the pain and discomfort of eczema flare-ups. To get relief, call or book your appointment online with Lakeside Dermatology today.